Nel 2012 la Santa Cruz Tallboy lt carbon che noi abbiamo nel nostro official test centre e’ stata riconosciuta la migliore bici da all mountain enduro 29er dell’anno. 29er-hungry dealers forced them to reconsider. Getting a late start may also have been a good thing for Santa Cruz, because all the pieces they needed to keep their house full of hard-core trail riders happy were readily obtainable. The original Tallboy was born a winner. It was lightweight, it had head-of-class handling, and under power, it steamed down the trail like a runaway locomotive. All it needed was more wheel travel. My first ride on the carbon fiber Tallboy LTc was the clincher. With 135-millimeters in the rear and 140 up front, 29er-adjusted fork geometry, and exquisitely balanced frame metrics, the bike melted away after a few hundred yards and I was flying. 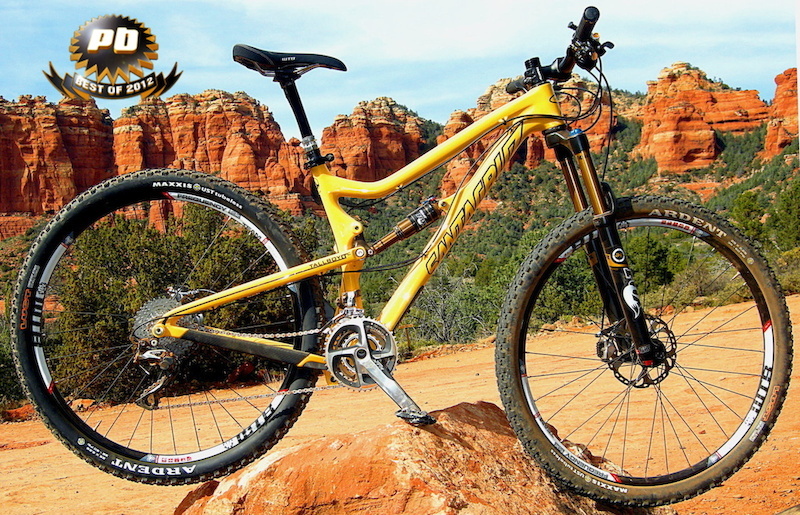 The reason the Tallboy LTc is my choice is that it breaks the mythology of the 29er vs the 26er. There is little or no perception of wheel size, no compensation for steering angle, no monkey motion required to properly weight the bike. It’s just a great ride. Santa Cruz found the nexus point between big wheels and proper bike handling.